Cambridge and Oxford follow the capital at over 13 times earnings while Glasgow and Liverpool have lowest income-to-price ratio. The average cost of a home in London is more than 14 times average earnings – the highest level on record, according to figures from property consultancy Hometrack. Oxford and Cambridge are not far behind, the company’s latest index of city prices indicates, with house prices at 13.5 and 13.6 times local earnings respectively. 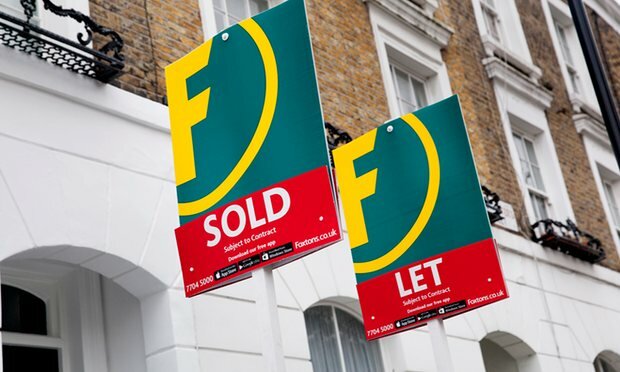 A lack of homes for sale combined with demand fuelled by low mortgage rates has pushed up average prices in London by 86% since 2009, according to Hometrack, to an average of £482,000. The increase is far in excess of wage growth and means prices are 14.2 times the average London wage packet of £33,720 a year – the highest multiple since 2002. Prices in London did falter during the credit crisis but it was not long before they resumed their upwards march. The boom is slowing however, Hometrack said, with the annual rate of growth in the capital falling to 9.1%, and the firm forecasting a further drop to “low single digits” in the next six to 12 months. The figures highlight how tough the housing market has become for prospective buyers in cities around the UK, with prices in all 20 tracked by Hometrack higher than their post-crash low. In Oxford, prices have increased by 72% since their nadir, to an average of £415,000, while in Cambridge the average has risen by 84% to £420,600 and in Bristol prices are up by 61% at £259,400. Glasgow has shown the smallest increase, with prices 13% above their low at £114,700. Prices in Glasgow are typically just 3.7 times local earnings, making it one of three cities where the ratio is below its long-run average, Hometrack said. The other two are Liverpool and Newcastle. At £112,700 the average price in Liverpool is 4.4 times earnings, while in Newcastle it is 4.8 times earnings at £122,600. Richard Donnell, insight director at Hometrack, said he expected Oxford and Cambridge to see falls in growth similar to that in London. Wednesday’s autumn statement included the announcement of a £2.3bn fund to pay for infrastructure that would unlock sites in areas of highest demand, in a move the government said would enable up to 100,000 more homes to be built. Donnell said the statement had focused on the longer term challenges of addressing housing supply. “This will have limited impact on the current profile of housing affordability in the near term which will be dictated by market forces and households’ expectations for jobs and the cost of borrowing,” he said. Figures from the Office for National Statistics indicate that saving for a deposit will get harder for those living in rented accommodation in many parts of Great Britain. The ONS’s latest private rental index suggested that in the year to October private rents in England increased by 2.5% in England, while in Wales they went up by 0.4%. Only Scotland recorded a fall, with rents down by 0.2%. Rent inflation was highest in the south-east of England, where tenants are paying 3.4% more than a year ago, and lowest in the north-east where costs have gone up by 1.1%.